Stimulus-secretion coupling was monitored with capacitance detection in bovine chromaffin cells recorded in perforated patch mode and stimulated with trains of depolarizing pulses. A subset of stimulus trains evoked a response with a Ca2+-exocytosis relationship identical to that obtained for single depolarizing pulses (Engisch and Nowycky, 1996). Other trains evoked responses with enhanced or diminished Ca2+ efficacy relative to this input–output function. The probability of obtaining a particular Ca2+-exocytosis relationship was correlated with the amount of Ca2+ entry per pulse, such that shorter pulses or smaller currents were associated with the greatest efficacy, and longer pulses and larger currents with the lowest efficacy. Apparent enhancements in Ca2+ efficacy were not caused by residual Ca2+ summing between pulses, because decreasing the interval between pulses usually reduced efficacy in the same cell; conversely, increasing the interval between pulses did not prevent an enhanced Ca2+-exocytosis relationship. Apparent decreases in Ca2+ efficacy were not caused by depletion of an available pool of release-ready vesicles, because an equivalent amount of total Ca2+entry during a single long depolarizing pulse usually evoked a much larger secretory response in the same cell. Finally, there were no striking differences in global Ca2+ levels monitored with the fluorescent indicator Fura Red that could account for apparent changes in Ca2+ efficacy during repetitive stimulus protocols. It appears that in chromaffin cells, the Ca2+-exocytosis relationship is subject to activity-dependent changes during a stimulus train and can be modulated up or down from a basal state accessed by single pulse stimulations. At fast synapses the postsynaptic response evoked by action potential stimulation is not constant but is subject to activity-dependent changes, becoming larger or smaller depending on the parameters of stimulation (for review, see Magleby, 1987). Although long-term changes in synaptic efficacy may be responsible for various forms of memory, short-term changes may contribute to temporal information processing and rapid changes in secretory output (Sejnowski, 1996; Fisher et al., 1997; Zador and Dobrunz, 1997). Until recently, the lack of sufficiently sensitive techniques limited detection of short-term changes in nonsynaptic secretory cells. This has changed with the development of the capacitance detection technique (Neher and Marty, 1982). When neuroendocrine and endocrine cells or large nerve terminals are stimulated by trains of depolarizing pulses, exocytosis can be detected as abrupt “jumps” in membrane capacitance (Cm). The Cm jumps evoked by individual pulses usually are nonuniform: typically,Cm jumps increase initially and then decrease in amplitude (Lim et al., 1990; Thomas et al., 1990; Augustine and Neher, 1992; Ämmäläet al., 1993; von Rüden and Neher, 1993; Horrigan and Bookman, 1994; Seward et al., 1995; Hsu and Jackson, 1996; Huang and Neher, 1996; Seward and Nowycky, 1996; Giovannucci and Stuenkel, 1997). By analogy with fast synapses, it has been suggested that Cm jump amplitudes increase because of Ca2+ accumulation during the beginning of a train (residual Ca2+ hypothesis) (Katz and Miledi, 1968). Ca2+ accumulation may directly affect the exocytotic trigger (Heinemann et al., 1993), contribute to recruitment of additional pools with different Ca2+ sensitivities (Horrigan and Bookman, 1994; Gillis et al., 1996; Giovannucci and Stuenkel, 1997), or fulfill “threshold” requirements for Ca2+ (Ämmälä et al., 1993; Seward et al., 1995; Seward and Nowycky, 1996; Giovannucci and Stuenkel, 1997). At fast synapses, diminished postsynaptic responses are commonly attributed to depletion of finite pools of release-ready vesicles, although postsynaptic receptor desensitization and Ca2+ current inactivation complicate interpretation. With capacitance detection, postsynaptic sensitivity is not an issue, and Ca2+ can be maintained at constant levels using photorelease of caged Ca2+. A decline in the rate of capacitance increase during sustained elevation of intracellular Ca2+ has been interpreted as evidence for rapid depletion of release-ready vesicle pools (Neher and Zucker 1993; Thomas et al., 1993; Heidelberger et al., 1994; Heinemann et al., 1994). In whole-cell mode, secretory responses are complicated by rundown and the presence of exogenous chelators (Augustine and Neher, 1992;Burgoyne, 1995; Seward and Nowycky, 1996), limitations that can be minimized with perforated-patch recordings (Horn and Marty, 1988). 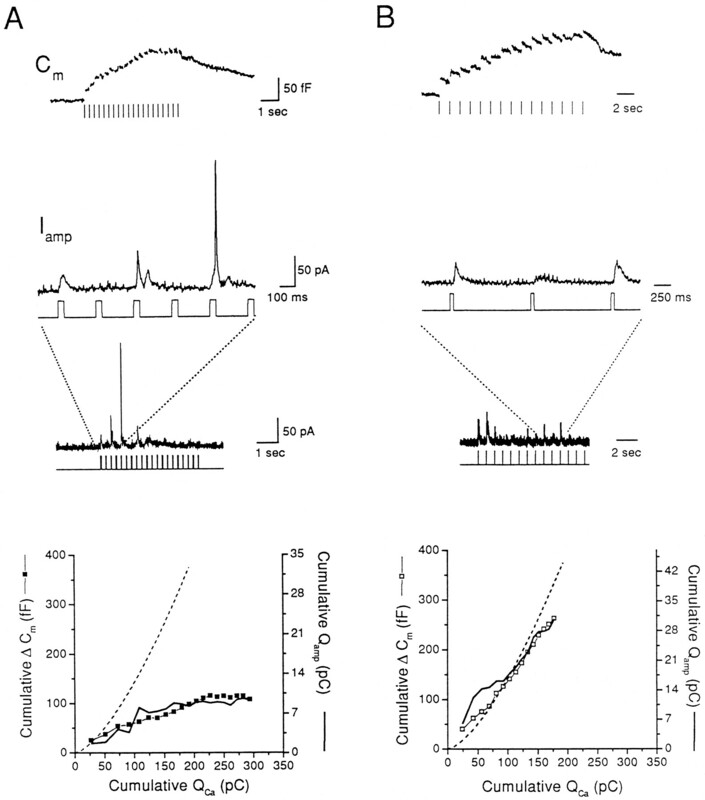 When intact bovine chromaffin cells are stimulated by single depolarizing pulses, exocytosis is a simple function of total Ca2+ entry regardless of current amplitude, number or type of Ca2+ channels, or pulse duration (Engisch and Nowycky, 1996). Here we examine the Ca2+-exocytosis relationship during repetitive stimulation. Depending on the amount of Ca2+ entry per pulse and interpulse interval, the Ca2+-exocytosis relationship was sometimes the same as that observed for single pulses, but was often enhanced or depressed relative to this relationship. Enhanced efficacy is unlikely to be caused by simple Ca2+ accumulation, because shorter interpulse intervals actually prevented enhancement. Depression is not caused by depletion of vesicle pools, because a single pulse could evoke a greater amount of exocytosis in the same cell. Thus, the Ca2+-exocytosis relationship in adrenal chromaffin cells is subject to short-term changes induced by patterned activity. Chromaffin cell culture. Adult bovine adrenal chromaffin cells were prepared by collagenase digestion as described inVitale et al., (1991) and cultured on collagen-coated glass coverslips as described previously (Engisch and Nowycky, 1996). Cells were used between day 3 and day 7 after plating; culture media were partially replaced on day 3 and day 6. Electrophysiological recording solutions. The standard bath solution for recordings contained (in mm): (A) 130 NaCl, 2 KCl, 10 glucose, 10 Na-HEPES, 1 MgCl2, 5N-methyl-d-glucamine, and 5 CaCl2, pH 7.2, with HCl; or (B) 130 NaCl, 2 KCl, 10 glucose, 10 Na-HEPES, 1 MgCl2, 5 CaCl2, pH 7.2, with NaOH. The perforated-patch solution contained (in mm): (A) 135 Cs-glutamate, 10 HEPES, 9.5 NaCl, 0.5 BAPTA, pH 7.2, with CsOH; or (B) 120 Cs-glutamate, 20 HEPES, 8 NaCl, 1 MgCl2, 0.5 EGTA, pH 7.2, with CsOH. Amphotericin B was included in the pipette solution according to one of the two following procedures: (A) A stock solution of amphotericin B (125 mg/ml in DMSO) was prepared every ∼2 hr by ultrasonication and kept protected from light at room temperature. The stock was added to the internal solution (final concentration of amphotericin B, 0.5 mg/ml), and the solution was homogenized on a Pro-250 homogenizer for 5–10 sec immediately before use; (B) a stock solution of amphotericin B (150 mg/ml) was kept frozen in the dark at −20°C for up to 2 weeks. Internal solution was added to the frozen aliquot (final concentration of amphotericin B, 0.6 mg/ml) and sonicated for 10–20 sec. Pipettes were dipped briefly in amphotericin B-free internal solution and backfilled with amphotericin-containing solution. Approximately equal numbers of cells were recorded in the pair of external/internal solutions labeled “A” and “B” (>50 each). Initially, each group was analyzed separately. Because no systematic differences were found, the data sets were pooled. In the figure legends, cell names beginning with “Chr” are from recordings in solution pair “B,” and all others are from recordings in solution pair “A.” All recordings were performed at room temperature (20–28°C), and cells were perfused continuously at a rate of 1–2 ml/min. CsOH was obtained from ICN Biochemicals (Aurora, OH), amphotericin B and glutamic acid from Calbiochem (La Jolla, CA), Na4-BAPTA from Molecular Probes (Eugene, OR), and DMSO from Aldrich (Milwaukee, WI). All other chemicals were from Sigma (St. Louis, MO). Capacitance detection. Capacitance measurements were performed using a List EPC-7 patch-clamp amplifier and a computer-based phase-tracking algorithm (Joshi and Fernandez, 1988; Fidler and Fernandez, 1989), as described previously (Seward et al., 1995). Data acquisition was initiated when the access conductance after patching became >70 nS (A) or >100 nS (B); access conductance usually stabilized at 100 nS (A) or 150 nS (B). The orthogonal phase angles for measuring capacitance and conductance were recalculated at the beginning of each capacitance trace, i.e., ∼15–20 sec, by switching in a 500 kΩ resistor in series with ground. Ten sine waves were averaged, giving a time resolution of either 14 or 18 msec per capacitance point (486 or 386 IBM-PC compatible computer, respectively). Stimulus protocols. Cells were held at −90 mV and depolarized to +20 mV for various durations as noted. The interpulse interval is the time between the end of one depolarization and the beginning of the next. To achieve a given interpulse interval experimentally, the time required for recording baseline current and allowing for channel closure after each pulse (i.e., the total duration of the current trace; see Figs. 1, 6) was subtracted from the desired interpulse interval, and the result was divided by the sampling rate per capacitance point. The quotient was used to set the number of capacitance points acquired between two depolarizing pulses; round-off can cause maximal errors of 6 or 8 msec for the 486- versus 386-based computer, respectively. A stimulus protocol was applied every ∼90–180 sec. Exocytosis during trains of pulses can have the same relationship to Ca2+ entry as during single pulses. A, Capacitance traces from three different cells, stimulated with trains of (A,i) 5 msec duration, 40 pulses, (A,ii) 10 msec duration, 30 pulses, or (A,iii) 40 msec duration, 20 pulses. All stimulus trains had 200 msec intervals. Cells Chr175, N021702, L012504.B, For the same cells as in A, cumulativeCm increases replotted against cumulative Ca2+ current integrals. For these plots the Ca2+ current during each pulse was integrated and summed to previous Ca2+ entry. The dashed curve represents the standard transfer function obtained from a study of single pulse depolarizations in 27 cells [ΔCm =0.147 * (ΣCa2+)1.5] (Engisch and Nowycky, 1996) (see Materials and Methods) and is not a fit to the data.C, Percentage of cells that responded to a given stimulus protocol with the same Ca2+-exocytosis relationship as obtained on average from single pulse depolarizations. Only a single repetition of a given protocol is included per cell, although two or three different protocols were used per cell where possible. The total number of analyzed trains is 5 msec pulse duration,n = 78; 10 msec pulse duration,n = 42; 40 msec pulse duration,n = 93. Long duration pulses in low extracellular [Ca2+] are equivalent to brief pulses in standard extracellular [Ca2+]. CumulativeCm responses from a single cell stimulated with two trains of 40 msec duration pulses and a train of 5 msec duration pulses in 5 mm extracellular [Ca2+], and a train of 40 msec duration pulses in 0.5 mm extracellular [Ca2+]. Thedashed curve represents the standard transfer function. The Ca2+ current evoked by the first pulse of each stimulus protocol is shown on the right. The current trace from only one of the two 40 msec duration pulse trains in 5 mm [Ca2+] is illustrated. Cell Chr0165. Data analysis. Ca2+ entry, in picocoulombs, was calculated from integration of Ca2+ currents using limits that excluded the major portion of the Na+ current. Before integration, currents were leak-subtracted with an average of four hyperpolarizing pulses. Capacitance changes were calibrated by a manual displacement of 100 fF in the capacitance compensation circuitry of the patch clamp. The amplitude of Cm jumps was determined from the difference between the average of 10 capacitance points before and after the depolarizing pulse (∼140–180 msec). Horrigan and Bookman (1994) reported a slow capacitative transient evoked by depolarizing pulses unrelated to exocytosis in rat chromaffin cells. This transient is much faster in bovine chromaffin cells recorded without tetrodotoxin (τ = 16 msec) (Chow et al., 1996) and has a much smaller amplitude. As a further check for possible contamination, we analyzed many of theCm responses to 5 msec duration pulses by comparing the last 3 points before depolarization to the last 3 points before the next depolarization. There was no significant difference from a 10-point average. Derivation of the standard transfer function. The standard input–output Ca2+ entry-exocytosis relationship was derived as follows: Cm responses evoked by single pulses were fit by the function ΔCm =g * (ΣCa2+)n, varying g, a proportionality constant and n, the power, until χ2 reached a minimum value, in 27 individual cells (Engisch and Nowycky, 1996). “ΔCm” is in femtofarads, and “ΣCa2+” is the integral of the Ca2+ current originally described in 107 ions, but in this report it is converted to picocoulombs. Curves generated by the 27 functions were averaged together in Origin (Microcal, Northampton, MA) to obtain a single curve that was in turn fit, giving ΔCm = 0.147 * (ΣCa2+)1.5 (standard transfer function). The plot of the standard transfer function is called the standard curve. Classification of Ca2+-exocytosis relationships. Capacitance responses were classified as those that followed the standard curve or were enhanced or depressed relative to the standard curve in two ways. (1) All of the plots of individual trains were overlaid on the standard curve and graded on the basis of visual inspection as following the curve, lying above it, or falling below. This was generally straightforward, with the exception of some 5 msec duration pulse trains with small amounts of exocytosis. The bar graphs in Figures 1, 2, 3 are generated from this method. (2) For the summary plot in Figure 4 and Table 1, the total amount of exocytosis and of Ca2+ entry for each train were compared with values generated by the function, ΔCm = 0.147 * (ΣCa2+)1.5. For trains with small amounts of total Ca2+ entry, trains were rated as following the standard relationship if they were within 20 fF of the predicted value. For trains with larger amounts of Ca2+ influx, ratios <0.8 were classified as depressed, whereas ratios >1.6 were classified as enhanced. Both methods gave similar final percentages. The Ca2+-exocytosis relationship during pulse trains can be enhanced relative to the standard transfer function obtained from single pulse depolarizations.A, Cumulative Cm increases plotted against cumulative Ca2+ current integrals during a train from three different cells, stimulated with (A,i) 5 msec duration, 30 pulses, (A,ii) 10 msec duration, 30 pulses, (A,iii) 40 msec duration, 20 pulses. All pulses were given at 200 msec intervals. Thedashed curve is a plot of the standard transfer function. Note the three different y-axis scales. Cells L012504, N122202, L012503. B, Superimposed first and last current trace for each stimulus train in A. The early rapidly decaying inward component is a Na+current. The Ca2+ current inactivates during all three stimulus trains, and there is no evidence for recruitment of a “facilitation” current (Artalejo et al., 1991). C, Percentage of cells that responded to a given stimulus protocol with a Ca2+ efficacy that was enhanced relative to the standard transfer function. Same data set as Figure 1C(see legend to Fig. 1). The Ca2+-exocytosis relationship during pulse trains can be depressed relative to the standard transfer function obtained from single pulse depolarizations.A, Cumulative Cm increases from three different cells, stimulated with (A,i) 5 msec duration, 30 pulses, (A,ii) 10 msec duration, 30 pulses, (A,iii) 20 msec duration, 20 pulses. The dashed curve is a plot of the standard transfer function. Cells L031105, Chr110, Chr043. B, CumulativeCm increases from three different cells stimulated with 40 msec duration, 10 pulses. Cells Chr171, Chr138, N012702. C, Percentage of cells that responded to a given stimulus protocol with a Ca2+ efficacy that was depressed relative to the standard transfer function. Same data set as Figures 1C, 2C (see legend to Fig.1). The Ca2+-exocytosis relationship during a stimulus train is correlated with the amount of Ca2+ entry during the first pulse. Responses to 219 stimulus trains were classified and binned according to the integral of the Ca2+ current evoked by the first depolarizing pulse of a train in 1 * 107 ion increments. The total experimental group consists of trains with pulse durations of 5 msec (n = 78), 10 msec (n = 42), 20 msec (n = 6), and 40 msec (n = 93); the range of Ca2+entry during the first pulse of each stimulus paradigm is indicated by the bars above. Bins are labeled such that each contains values that range from its preceding neighbor to itself (i.e., the first bin contains stimuli with 0–1 * 107Ca2+ ions, whereas the second bin includes pulses with 1–2 * 107 Ca2+ ions). The last bin contains all values >12 * 107Ca2+ ions, with a maximal value of 20 * 107 Ca2+ ions. Only the first train of any given protocol is included per cell, although for most cells, two or more different stimulus protocols are included. The response type was defined by the computer-based algorithm described in Materials and Methods as following the standard transfer function established by single pulse depolarizations, or being enhanced or depressed relative to this curve. Amperometry. Amperometric electrodes were manufactured according to Kawagoe et al. (1993). Briefly, a single 8 μm carbon fiber was inserted into a glass capillary and pulled on a two-stage microelectrode puller (Narishige, Tokyo, Japan). The fiber extending from the pulled end of the glass was cut with iridectomy scissors, and the tip was dipped in freshly prepared liquid epoxy. The epoxy was dried overnight at room temperature and then cured at 150°C for 2–24 hr. Electrodes were used within 1–3 d of manufacture, and the carbon fiber tip was cut with a scalpel blade immediately before recording. Carbon fiber electrodes were backfilled with a 1 m KCl solution, and held at +700 mV using a modified PC-501 amplifier (Warner Instruments, New Haven, CT); oxidative currents attributable to catecholamine release were measured in voltage clamp. After a seal was obtained and during perforation, a carbon fiber microelectrode was manipulated onto the top of a chromaffin cell until they touched. Amperometric events evoked by depolarization were acquired at 1 kHz in Axobasic on a second computer that was under control of the capacitance acquisition software. Catecholamine release was quantified by integrating the area under the amperometric trace during and for 200 msec after each depolarizing stimulus, regardless of the interpulse interval, and is expressed in picocoulombs. For display, amperometric traces were imported into Origin (vers. 3.5; Microcal, Northampton, MA) and digitally filtered with a Fourier algorithm. Amperometric spikes were identified by a peak fitting subroutine (“Pick Peaks”) in Origin. In Figures 10 and 11, the final cumulative amperometric value was normalized to the total cumulative Cm change with no adjustments for the initial baseline or response to the first pulse. Cells recorded with amperometric electrodes are excluded from the data sets in Figures 1, 2, 3, 4, 5, 6, 7, 8, 9 and Table 1. “Depressed” capacitance responses are not an artifact of simultaneous endocytosis. A, Top trace(Cm): Capacitance trace from a cell stimulated with 40 msec duration pulses at 200 msec intervals (20 pulses). Timing of depolarizations is indicated by gapsin the trace and by the vertical bars below.Middle traces (Iamp): Amperometric recording during the same stimulus shown on an expanded (above) and compressed (below) time scale. Timing of depolarizations is indicated below each trace.Bottom, Left axis: Plot of cumulativeCm increases against cumulative Ca2+ entry. The dashed curve is a plot of the standard transfer function. The Ca2+-exocytosis relationship of this cell is strongly depressed. Right axis: The amperometric signal during the stimulus train was integrated and is expressed in picocoulombs. For comparison to the capacitance response, the maximum amperometric response was aligned with the maximumCm increase and plotted against cumulative Ca2+ entry (solid line).B, The same cell was stimulated with 40 msec duration pulses at 1000 msec intervals (15 pulses). Calculation of ΔCm was performed by using only the first 200 msec after each depolarization. Calculation ofQamp was performed by integrating the current during and for 200 msec after each depolarization. All traces, plots, and vertical scales as in A. Cell L080104. Amperometric recordings confirm thatCm increases with enhanced Ca2+ efficacy reflect exocytosis of catecholamine-containing vesicles. Top trace(Cm): Capacitance trace from a cell stimulated with 5 msec duration pulses, 200 msec intervals (35 pulses). Timing of depolarizations is indicated by gaps in the two traces and by the vertical bars below. Middle traces (Iamp): Amperometric recording during the same stimulus shown on an expanded (above) and compressed (below) time scale. Timing of depolarizations is indicated by the vertical steps. Bottom plot:Left axis: Plot of cumulativeCm increases against cumulative Ca2+ entry. The dashed curve is a plot of the standard transfer function. Right axis: The amperometric signal during the stimulus train was integrated and is expressed in picocoulombs. For comparison with the capacitance response, the maximum amperometric response was aligned with the maximum Cm increase and plotted against cumulative Ca2+ entry (solid line). Cell L061703. Trains of 5 msec pulses always evokeCm responses with equal or greater Ca2+ efficacy than trains of 40 msec pulses in individual cells. A–D, Examples of capacitance responses to 5 and 40 msec pulse trains from four separate cells. In all panels, cumulative Cm increases are plotted against cumulative Ca2+ entry with the 5 msec (open triangles) and 40 msec duration pulse train (closed squares) superimposed. 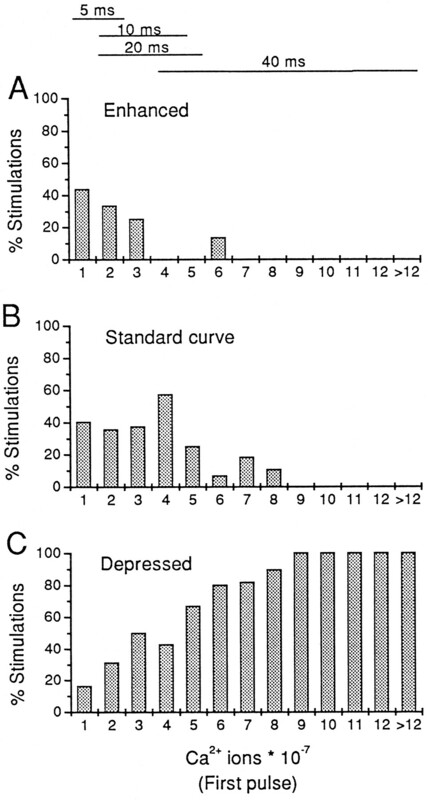 Cells were selected to illustrate pairs of responses that were (A) both depressed, (B) standard curve versus depressed, (C) enhanced efficacy versus depressed, (D) enhanced versus standard curve. Cells (A) Chr172, (B) N112704, (C) Chr061, (D) N122202.E, Percentage of cells stimulated with both 5 and 40 msec pulse trains that exhibit particular pairs of Ca2+ efficacy. The Ca2+-exocytosis relationship for each 5 and 40 msec pulse train was classified as either depressed (D), enhanced (E), or one that obeys the standard transfer function (S) and expressed as a percentage of total cells stimulated with the two-pulse protocols (n = 73). In the majority of cells, 5 msec pulse trains evoked exocytosis with greater Ca2+ efficacy than 40 msec pulse trains (S-D, E-D, E-S), whereas in the remaining 18% the trains evoked responses with similar efficacies (D-D, E-E). Stimulus trains consistently evoke changes in efficacy relative to single pulses. A,i, Responses of a single cell to four stimulus protocols as indicated. Plot of cumulativeCm increases against cumulative Ca2+ entry. In this example of a cell predisposed to depression, all three train protocols evoked depressed responses, but a single 320 msec pulse evoked a robust Cmjump that lies close to the standard curve (dashed line). Cell L082003. 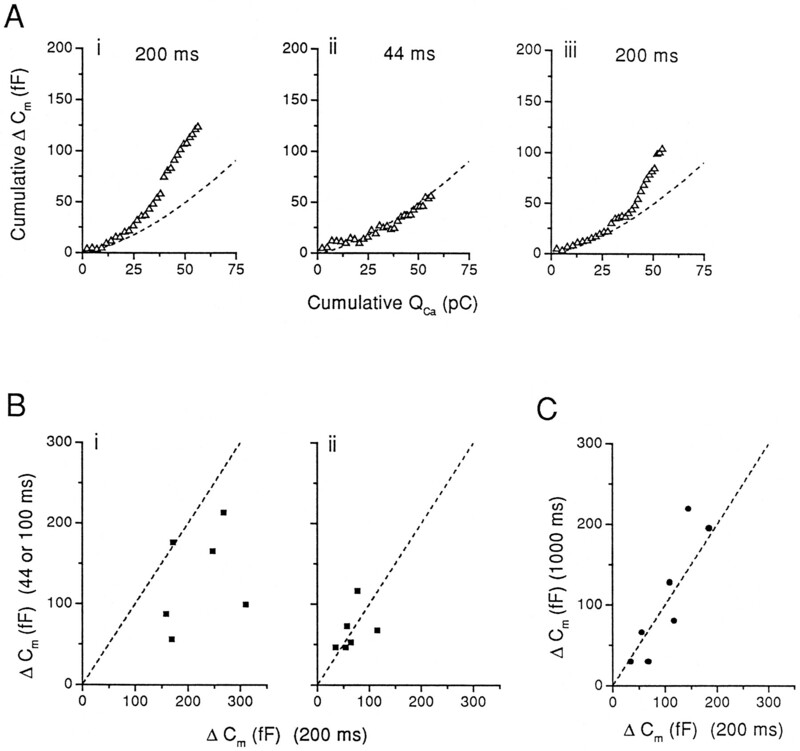 A,ii, Comparison of the response to a single 320 msec depolarization to theCm increase evoked by an equivalent amount of Ca2+ entry during a 40 msec duration pulse train in 32 cells. Data represent mean ± SEM (p < 0.001; paired t test. )B,i, Responses of a single cell to three stimulus protocols as indicated. In this typical cell, the response to a 5 msec train is enhanced, and the response to a single 40 msec pulse (open square) and 320 msec pulse (filled diamond) lies close to the standard curve (dashed line). Cell L032704. B,ii, Comparison of the response to a single 40 msec pulse to the Cmincrease evoked by an equivalent amount of Ca2+entry during a 5 msec train in 46 cells. Data represent mean ± SEM (p < 0.001; paired ttest). Longer interpulse intervals increase the Ca2+ efficacy of 40 msec duration pulse trains.A, Examples of capacitance changes in three cells stimulated with two 40 msec pulse protocols, at 200 and 1000 msec intervals. In all panels, cumulative Cmincreases are plotted against cumulative Ca2+ entry with the two trains superimposed. The dashed curverepresents the standard transfer function. Examples of (A,i) two depressed responses, (A,ii) a depressed response at 200 msec intervals and a response that follows the standard curve at 1000 msec intervals, and (A,iii) a response that follows the standard curve at 200 msec intervals and has enhanced efficacy at 1000 msec intervals. Cells Chr058, Chr059, and Chr200. B, Comparison of the totalCm responses evoked by a 200 msec versus 1000 msec interval stimulus protocol, 40 msec duration, 10 pulses, in individual cells. The line represents the best fit by linear regression and has slope = 2.15 (r = 0.87; n = 17). C, The totalCm increase for a given test interpulse interval was normalized to the total Cmincrease elicited by a 40 msec duration, 200 msec interval stimulus in the same cell. Test protocols had intervals of 400 msec (n = 5), 800 msec (n = 4), or 1000 msec (n = 17). Data are presented as mean ± SD. Shorter interpulse intervals can decrease Ca2+ efficacy of 5 msec duration pulse trains.A, Example of single cell stimulated with three trains. The stimulus protocol consisted of 5 msec duration, 30 pulses, at either 200 msec intervals (A,i and A,iii) or 44 msec interpulse intervals (A,ii). Stimulus trains in A,i and A,iii were applied just before and after the stimulus train in A,ii. CumulativeCm increases are plotted against cumulative Ca2+ entry. The dashed curve is a plot of the standard transfer function. The Ca2+-exocytosis relationship is enhanced at the longer interval but follows the standard curve during the shorter interval. Note that there was slightly more total Ca2+ entry in A,ii, typical for higher frequency protocols (see text). Cell N041002. B, Comparison of total Cm responses in 12 cells stimulated with two trains of 5 msec duration pulses, at 200 msec intervals and either 44 or 100 msec intervals. Cells were divided into those that had an enhanced response during the 200 msec train (i, total ΔCm > 150 fF) or those that followed the standard curve (ii, total ΔCm <150 fF). The dashed line has a slope of 1 and represents equivalent responses during the two trains. Points below the line indicate that the higher frequency train evoked a smaller totalCm response. C, Comparison of total Cm responses in seven cells stimulated with two trains of 5 msec duration pulses, at 200 msec and 1000 msec intervals. The range of Cm values in this plot is smaller than in B because the lower frequency trains contained fewer total pulses and the totalCm responses were compared for an equivalent number of pulses in each train. Most points fall on or near a line with slope = 1 (dashed line), indicating equal amounts of Cm increase during the two stimulus protocols. Measurement of average intracellular [Ca2+]. Changes in average intracellular [Ca2+] levels were monitored with the calcium-sensitive fluorescent indicator Fura Red (Molecular Probes). Cells were loaded by incubation in 5 μm Fura Red AM, 0.02% Pluronic F-127 in culture medium for 35–45 min at 37°C. Coverslips were rinsed with culture medium and returned to the incubator for up to 60 min before experiments. Fura Red was excited at two wavelengths, 440 nm (Ca2+ insensitive) and 490 nm (Ca2+ sensitive). Light from a conventional Hg arc lamp was passed through one of two interference filters in a motorized filter wheel (Oriel, Stratford, CT) and was reflected via a dichromic mirror (RKP 510 nm) onto the cell. Emitted light passed through a barrier filter (580 nm). Measurements at the Ca2+-insensitive wavelength were made only before and after stimulus protocols. At the end of some recordings, a solution with 10 μm ionomycin (Calbiochem) and 10 mmCa2+ was perfused into the bath to obtain a fluorescence signal at saturating Ca2+ levels. Light was collected by a Gen III camera, and images were processed via a Digidata 2000 Image Lightning board (Axon Instruments, Foster City, CA) installed on a second computer. Images were collected at one-half video frame rate so that an image was obtained every 66 msec or ∼4 capacitance points. Filter switching, shutter opening, and video acquisition were controlled by the capacitance detection software. Acquired images were processed using Axon Imaging Workbench (Axon Instruments). The total fluorescence of the cell was determined from the average intensity of pixels over the cell, and the digitized data were imported into Origin for further analysis. Changes in Ca2+ concentration were calculated as a fractional fluorescence change inF440/F490. In a series of control experiments we found that there was a slight increase in fluorescence measured at 440 nm excitation when Ca2+ concentration increased from zero (solution buffered with 10 mm EGTA) to 10 mmCa2+ in the presence of ionomycin. Because of this error, we calculated that for a saturating signal fractional fluorescence would be underestimated by 10–15%, at most; because the maximal changes evoked by depolarization were much smaller, the error should be even less. Cells preloaded with Fura Red are excluded from the data sets in Figures 1, 2, 3, 4, 5, 6, 7, 8, 9 and Table 1. We have shown previously that in chromaffin cells recorded with perforated-patch methods, the relationship between Ca2+ entry and exocytosis evoked by single pulses can be described by a simple transfer function of the form ΔCm = g * (ΣCa2+)n, where ΔCm is the change in cell surface capacitance in femtofarads, g is a proportionality constant, and ΣCa2+ is the integral of the Ca2+ current that is raised to the nth power (Engisch and Nowycky, 1996). There is no reason a priori to expect that exocytosis during the intermittent Ca2+entry of a train should be evoked with the same Ca2+efficacy as during a single long pulse. For equivalent amounts of Ca2+ entry, the two stimulus paradigms differ in at least two ways: (1) the Ca2+ concentration beneath the membrane should be lower during a train, because Ca2+ domains around open Ca2+channels collapse between depolarizations, and Ca2+is removed by diffusion and uptake mechanisms; and (2) the total elapsed time is much longer during a train, allowing time-dependent processes to take place. Remarkably, a significant fraction of pulse trains evoked responses that exactly or closely followed a standard Ca2+-exocytosis transfer curve obtained by averaging input–output functions for single pulses in 27 cells (see Materials and Methods). Examples of three such responses, each from a different cell, are shown in Figure 1. Without analysis, the Cm responses appear to differ greatly, with more exocytosis evoked by protocols with longer pulse durations and larger Ca2+ loads (Fig.1A). However, when the same data are plotted as a function of the cumulative sum of Ca2+ current integrals for each pulse (Fig. 1B), the Ca2+-exocytosis relationships for all three protocols are nearly identical to that evoked by single pulses: the dashed curve represents the standard curve and is not a fit of the data. Thus, in different cells an identical Ca2+-secretion relationship can be evoked by train protocols that differ in the number of pulses, total elapsed time, and amount of Ca2+ influx per pulse. The percentage of responses that obeyed the standard transfer function depended on the stimulus protocol (Fig. 1C). At fixed 200 msec interpulse intervals, stimulation with trains of 5 and 10 msec duration pulses evoked responses that followed the standard curve in >50% and 35% of chromaffin cells, respectively. Trains of 40 msec pulses evoked an exocytotic response with this pattern of Ca2+ efficacy in <10% of cells. The remaining responses were classified as being enhanced or depressed relative to the standard curve (see below). Examples of responses with greater Ca2+efficacy than predicted by the standard transfer function are shown in plots of cumulative Cm changes versus cumulative Ca2+ entry (Fig.2A) (three different cells). The Cm responses initially follow the standard Ca2+-exocytosis relationship (dashed curve), but after a variable delay deviate to the left. Within the resolution limits imposed by noise in the Cmrecording, the switch to enhanced Ca2+ efficacy appeared to be relatively abrupt. For example, in Figure2A,ii the shift occurs after eight to nine pulses, whereas in Figure 2A,i after a few pulses, and in Figure 2A,iii, after only one pulse. Once a state of enhanced efficacy was achieved, cumulative Cmincreases proceeded as a fairly linear function of cumulative Ca2+ entry, without either the upward curvature characteristic of the standard curve (Fig. 1) or the downward curvature of depressed responses (below and Fig.3). The percentage of cells that gave enhanced responses to trains of 5, 10, and 40 msec duration pulses is summarized in Figure 2C. Stimulation with 5 msec duration pulse trains evoked responses with enhanced efficacy in 33% of cells; 10 msec duration pulse trains did so in 28% of cells, and 40 msec duration pulse trains in only 2% of cells tested. In all cells, the voltage-gated Ca2+current showed typical inactivation during a train (Fig.2B; comparison of first and last current), with no evidence for activation of additional “facilitation” channels as described for calf chromaffin cells (Artalejo et al., 1991, 1994). Some exocytotic responses to pulse trains proceeded with diminished Ca2+ efficacy; that is, they were depressed relative to the standard curve. Figure 3Aillustrates typical examples of such responses evoked by protocols of brief pulses (5, 10, and 20 msec duration pulses; three different cells). The plots of cumulative Cm increases versus cumulative Ca2+ entry are approximately linear, deviating from the standard curve (dashed curve) because they lack upward curvature. In these examples, Ca2+ entry continues to elicit exocytosis throughout the stimulus train. Three examples of diminished efficacy evoked by protocols with longer pulses (40 msec duration pulses) are shown in Figure 3B. In some cells (Fig. 3B,i), each pulse contributed additionalCm increases as during shorter pulse protocols (Fig. 3A,i–iii). In other cells, exocytosis ceased abruptly during the train, either after following the standard relationship for several pulses (Fig. 3B,ii) or for only a single pulse (Fig.3B,iii). Figure 3C summarizes the likelihood of obtaining a depressed response with each pulse protocol. Protocols of 40 msec duration pulses evoked responses with a diminished Ca2+-exocytosis relationship in the majority of cells (∼90%), whereas 10 msec duration pulse trains did so in 38% of cells. Trains of 5 msec duration pulses evoked depressed responses in a small but significant fraction of cells (∼15%). Under our culture and recording conditions, Ca2+ current amplitudes vary by as much as fivefold between cells. This allowed us to relate the likelihood of obtaining a particular Ca2+-exocytosis relationship to the amount of Ca2+ influx during the first pulse of a train. A total of 219 capacitance responses were classified as having an enhanced, standard, or depressed Ca2+-exocytosis relationship, with only one train of a given pulse duration included per cell. The data were binned by the integral of the first Ca2+ current, and the results are plotted as the percentage of responses within each bin. Responses with enhanced Ca2+ efficacy are clearly correlated with the smallest amounts of Ca2+ entry (Fig. 4A). Exceptions do occur, however, as was illustrated for a 40 msec train in Figure2A,iii. Responses that follow the standard curve are also associated with small amounts of Ca2+ entry (Fig. 4B), but they occur over a broader range, without the clear preference for the smallest Ca2+current integrals. Depressed responses were evoked over the entire range of Ca2+ values, but the likelihood rose steadily with increasing Ca2+ entry during the first pulse (Fig. 4C). Trains of 40 msec duration pulses with average or larger than average Ca2+ currents always evoked depressed responses (integral ≥ 9 * 107ions or 28.8 pC; n = 40 cells). The histograms in Figure 4 indicate that the type of Ca2+-exocytosis relationship is correlated with, but not a strict function of, Ca2+ entry per pulse. The data in Figures 1, 2, 3, 4 were compiled by including only the first occurrence of a particular stimulus protocol per cell and therefore reflect the variability between cells. In the next four sections, we examine the capabilities of individual cells to respond to two different stimulus protocols. We analyzed the exocytotic responses to a single pair of 5 and 40 msec duration pulse trains in 73 cells. In the majority of cells (∼82%), Ca2+ efficacy was greater during the 5 msec train than during the 40 msec train. If the response to the 40 msec pulse train was depressed, that evoked by the 5 msec pulse train either followed the standard curve (Fig.5B) or was enhanced (Fig.5C). If the response to a 40 msec pulse train was not depressed, the 5 msec pulse train always evoked responses with enhanced Ca2+ efficacy (Fig. 5D). This is summarized in Figure 5E, where each bar represents the fraction of cells in which a pair of 5 and 40 msec pulse trains had the indicated Ca2+-exocytosis relationships. The only exceptions to this pattern were cells in which both trains evoked depressed responses (Fig. 5A; 15% of cells) and two cells (∼3%) in which both trains evoked enhanced responses (not shown). Thus a few cells appear to be predisposed to enter a particular Ca2+-exocytosis mode during repetitive stimulation. However, within a given cell, larger amounts of Ca2+never evoked exocytosis with a higher efficacy (n = 73 cells). Depressed responses to 40 msec trains were frequent (n= 63/73 cells), and we were able to subdivide this population further into two groups based on the timing of the shift to depression (e.g., compare Fig. 3B,iii with 3B,ii). Table1 summarizes the results. Cells that became depressed quickly (1–3 pulses; “Depressed”) account for the entire group of depressed responses to 5 msec pulse trains and otherwise usually followed the standard curve. Cells that followed the standard curve for more than three pulses before becoming depressed (“St. C.–Depr.”) were more likely to respond to a 5 msec train with enhanced efficacy. Thus, although the Cm response to a given amount of Ca2+ entry during a stimulus train cannot be predicted with certainty for any particular cell, changing the amount of Ca2+ entry per pulse results in an orderly, consistent shift between Ca2+-exocytosis relationships within individual cells. At fixed interpulse intervals, this shift can be summarized by the following scheme: Depressed ⇒ St. Curve–Depressed ⇒ St. Curve ⇒ Enhanced ↓ Ca2+ ⇒. We tested whether the shift between Ca2+-exocytosis relationships depended in any way on the duration of depolarization by varying external Ca2+ concentrations (5 mm vs 0.3 or 0.5 mm). Figure 6 illustrates an experiment in which the response evoked by a 40 msec pulse train in 5 mm Ca2+ is depressed, and the response to a 5 msec pulse train follows the standard single-pulse relationship (dashed curve). In low Ca2+ (0.5 mm), the Ca2+ efficacy during a train of 40 msec pulses became identical to that evoked by a 5 msec train in 5 mm Ca2+. In five such experiments, all cells had depressed responses during a 40 msec pulse train in 5 mm Ca2+. In low Ca2+, only one response remained depressed, two followed the standard curve, and two had enhanced efficacy. Thus diminished efficacy is induced by large amounts of Ca2+ entry rather than long depolarizations. In this study, we define “depressed” or “enhanced” Ca2+ efficacy relative to a standard transfer function generated by averaging responses to single pulses in a separate cell population (see Materials and Methods). Ideally, the secretory responsiveness should be determined for each cell, but this was not feasible because of technical restrictions on the duration of patch-clamp recordings. However, the validity of using the standard transfer function can be checked by comparing the response to a single pulse and a stimulus train in a subset of cells. We compared the total Cm increases evoked by a single 320 msec pulse and an equivalent amount of Ca2+ entry during a 40 msec train with 200 msec intervals. A total of 32 cells were stimulated with both protocols; as expected, most responses to the train had diminished efficacy. On average, the Cm increase during the 320 msec pulse was 1.8 times larger (Fig.7A,ii). This is a minimum estimate of the relative efficacy of a 320 msec pulse and 40 msec pulse trains because (1) all responses to 40 msec pulse trains were included, although not all were depressed; and (2) this comparison ignores the final ΔCm/ΣCa2+ratio during trains that was very low, because Ca2+entry during later pulses was often completely unable to evokeCm increases (e.g., Fig. 3B,ii,iii). We also observed (Fig. 7A,i) that a single 320 msec pulse could evoke a robust response even in cells most predisposed to depression during a repetitive pulse protocol, that is, the 15% that were depressed during both the 5 and 40 msec train (Fig. 5A, Table 1). To examine a lower range of Ca2+ entry, we comparedCm responses evoked by a single 40 msec pulse and an equivalent amount of Ca2+ entry during a train of 5 msec duration pulses in 46 cells (Fig. 7B,i,ii). On average, a single 40 msec pulse was only half as effective at evoking exocytosis as a train of brief pulses. Again, this is a minimum estimate because <40% of cells had responses with enhanced efficacy during a train, yet all 5 msec pulse trains are included in this analysis. Thus, the changes in efficacy observed during repetitive pulse protocols are caused not by differences in the basal secretory responsiveness of cells but by activity-dependent mechanisms. 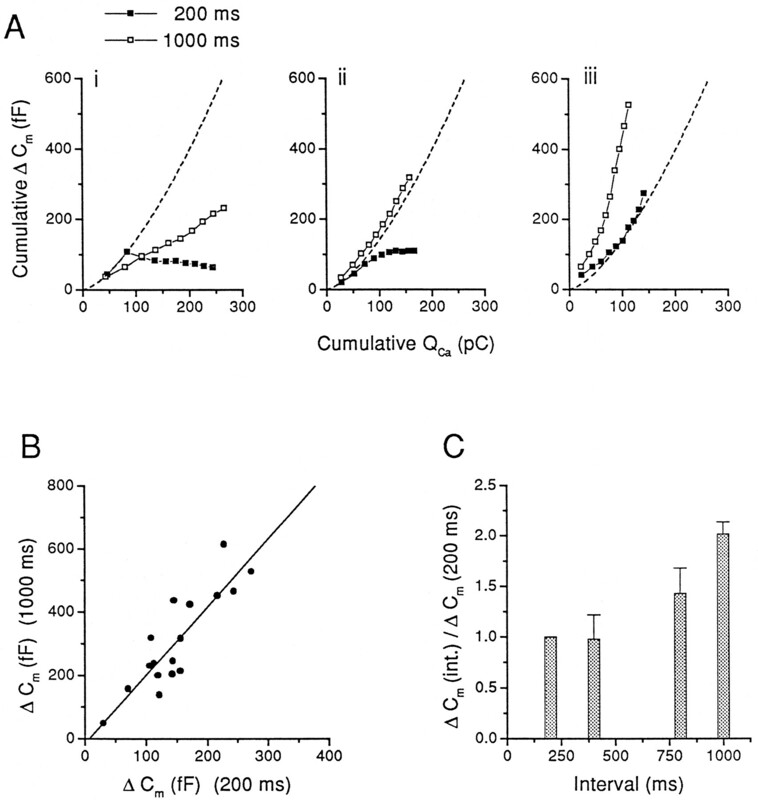 The previous sections describe the different exocytotic responses obtained when the amount of Ca2+ entry is altered at a constant interpulse interval (200 msec). To examine whether the exocytotic response of a cell is also influenced by the time span between bouts of Ca2+ entry, we tested various interpulse intervals. Trains of 40 msec pulses at 200 msec intervals evoked depressed responses in most cells (Figs. 3C, 4). Prolonging the interpulse interval increased the Ca2+ efficacy without significant changes to total Ca2+ entry (Fig. 8). Three examples comparing a 200 and a 1000 msec interval stimulus train within individual cells are shown in Figure 8A. Cells with strong depression during the 200 msec train showed a partial relief of depression at 1000 msec intervals (Fig. 8A,i) or followed the standard curve (Fig. 8A,ii), whereas cells with less depression often gave large responses with enhanced Ca2+ efficacy (Fig. 8A,iii). A summary of 17 experiments is presented in Figure 8B, in which the total Cm increase evoked by the two protocols is compared. Despite the large variability of total ΔCm during the 200 msec train, all data points cluster along a line with slope = 2. Thus within individual cells, there is a systematic shift of Ca2+ efficacy, remarkably similar to the shift that is observed as pulse duration is decreased at a constant interpulse interval (Fig. 5, Table 1). The shift was graded with the duration of the interpulse interval: at 400 msec intervals, there was no significant change, whereas at 800 msec responses were 1.35 times larger and at 1000 msec were two times larger (Fig. 8C). We also tested the effect of shorter intervals during 40 msec duration pulse trains because this should approach the limit of a single prolonged pulse (0 msec interval) and possibly prevent the development of depression. Of all stimulus protocols tested, 40 msec pulses at 100 msec intervals gave the least consistent results. In 3 of 11 cells, depression was abolished at the shorter interval as predicted. However, in five cells the Ca2+-exocytosis relationship was unchanged, one cell showed more depression, and two cells had rapid endocytosis. Thus although there is a slight tendency toward less depression at short intervals, the responses are too variable for further study. The effect of shortening interpulse intervals during trains of 5 msec duration pulses depended on the response evoked by a train with 200 msec intervals. In five of six cells with enhanced Ca2+ efficacy during a 200 msec interval train, trains with shorter intervals evoked exocytosis with reduced efficacy (Fig. 9B,i). Figure9A illustrates one such experiment. Two trains with 200 msec intervals evoked exocytosis with enhanced efficacy (Fig.9A,i,iii), whereas the Ca2+-exocytosis relationship during a 44 msec interval train followed the standard curve (Fig. 9A,ii). On the other hand, in six cells whose response followed the standard curve during 200 msec intervals, shortening the interval had little effect (Fig. 9B,ii). As suggested above, both results are expected if brief interpulse intervals approach the limiting condition of a single long pulse from which the standard transfer function is obtained and if enhanced efficacy is a departure from this basal responsiveness. In Figure 9A, the higher frequency train (Fig.9A,ii) induced slightly more total Ca2+entry than either 200 msec interval train (Fig. 9Ai,iii). This was a consistent finding in all cells tested: on average total Ca2+ entry was 1.12-fold greater during the higher frequency, 5 msec duration pulse trains (SEM = 0.03;n = 12; p < 0.01; paired ttest). It appears that in addition to exocytosis, Ca2+ current inactivation is also subject to frequency-sensitive modulation in chromaffin cells. Increasing the interpulse interval from 200 msec to 1000 msec had little effect on the Ca2+-exocytosis relationship evoked by 5 msec pulse trains. The results are summarized in Figure9C for seven cells. All values lie close to the dashed line that represents equivalency. The capacitance detection method reports only net changes of plasma membrane area. The apparent depression of exocytosis may be caused by simultaneous membrane removal by endocytosis. On the other hand, the apparent enhancement may actually be caused by the addition of some other type of membrane. For example, exocytosis of small synaptic vesicles versus large dense-cored vesicles is evoked by different Ca2+ levels (Verhage et al., 1991) and stimulus patterns (Bruns and Jahn, 1995). Finally, apparent enhancement may result from totally artifactual sources such as gating charge movement (Horrigan and Bookman, 1994). These issues can be resolved with amperometric techniques that specifically detect the release of catecholamines (Wightman et al., 1991). Simultaneous capacitance and amperometric recordings of a typical strongly depressed response to a train of 40 msec duration pulses, 200 msec intervals are shown in Figure10A. The amperometric events are few, and all occur during the early part of the train when the Cm trace shows a small increase. The cumulative integral of the amperometric signal initially rises in parallel with the Cm response but is flat during the rest of the train (Fig. 10A, bottom), indicating that catecholamine release and Cm increases stop simultaneously. Amperometric events occurred only during the first few pulses in five of six cells with depressed Cmresponses to 40 msec trains. The cell shown in Figure 10A was also stimulated with a train of 40 msec duration pulses, but with 1000 msec intervals (Fig.10B). As described above (Fig. 8), longer interpulse intervals typically relieve depression; here, theCm response closely follows the standard curve (bottom). Amperometric events occurred throughout the entire duration of the train, mirroring the persistence ofCm jumps. Because of the relatively long interval between pulses, endocytotic processes are clearly visible as declines in the Cm trace. As a result, the difference between the pre- and post-train Cmlevel appears to be ∼100 fF for both trains (Fig. 10A,B, top). In calculating ΔCm for cumulative plots, we used only the first 200 msec after each pulse (see Materials and Methods). This calculation gives a total ΔCm change of ∼250 fF (Fig.10B, bottom) and a ∼2.5 times increase over the 200 msec interval train. Qamp is similarly increased by approximately three times. These data confirm thatCm changes parallel catecholamine release and indicate that endocytotic processes are too slow to mask exocytosis during 200 msec interval protocols. Figure 11 contains an example of a cell in which a 5 msec duration pulse train evoked a capacitance response that was strongly enhanced relative to the standard curve. The capacitance trace (Cm, top) has small, step-like increases throughout the train. In the amperometric recording, large upward spikes are uniformly scattered throughout the duration of the stimulus (Iamp). In cells that had an enhanced response to a 5 msec duration pulse train, there were more spikes than in cells with responses that followed the standard transfer function (0.25 events/pulse, n = 4, vs 0.057 events/pulse,n = 4, respectively). This confirms that the enhancement of Ca2+ efficacy is attributable to the addition of membrane from catecholamine-containing vesicles. Amperometric recordings also rule out the possibility that the apparentCm changes are caused by an artifact such as an ion channel gating charge, which might be particularly prominent in a long train of brief pulses (Horrigan and Bookman, 1994; Engisch and Nowycky, 1996). An apparent increase in the efficacy with which Ca2+ entry evokes exocytosis may actually be caused by Ca2+ contribution by intracellular stores. On the other hand, apparent diminished efficacy may result from the recruitment of rapid Ca2+ clearing mechanisms after large amounts of Ca2+ influx (Rorsman et al., 1992,Peng and Zucker, 1993; Hehl et al., 1996), or they may be caused by inhibitory effects of high [Ca2+]i. To determine this, we monitored fluorescence in cells preloaded with the Ca2+-sensitive dye Fura Red AM. Typical fluorescence changes evoked by four stimulus protocols in a single cell are illustrated in Figure12. A single 320 msec pulse caused a rapid rise in global [Ca2+]i that peaked ∼40 msec after the pulse (Fig. 12A,i). A train of 40 msec duration pulses, 200 msec intervals, evoked a [Ca2+]i rise to the same peak level within the first three to four pulses (Fig. 12A,ii) that was maintained despite further doubling of Ca2+entry between the fourth and tenth pulse (data not shown). During a train of 5 msec pulses, 200 msec intervals, [Ca2+]i also rose to a plateau level, but this level was reached later and the final value was lower than during the 40 msec pulse train (Fig. 12A,iii). Finally, during a train of 40 msec pulses given at 1000 msec intervals, the maximal fluorescence signal was nearly identical to the plateau level of the 200 msec interval train; however, the signal decayed between each pulse (Fig. 12A,iv). Average [Ca2+]i is rapidly elevated to plateau levels during trains of depolarizing pulses in bovine chromaffin cells recorded in perforated patch mode.A,i--iv, Four fluorescence ratios from a single cell loaded with Fura Red AM evoked by (i) a single 320 msec depolarization; (ii) train of 40 msec duration, 200 msec interval, 10 pulses; (iii) train of 5 msec duration, 200 msec interval, 40 pulses; (iv) train of 40 msec duration, 1000 msec interval, 10 pulses. All stimuli are indicated bybars below the trace. Traces in i andii are shown on expanded time scale, and each are fit with a single exponential with τ = 2.8 and 3.5 sec, respectively. Thedashed line in i represents the fluorescence ratio when ionomycin (10 μm) in external solution containing 10 mm CaCl2 was applied at the end of the experiment to saturate the Ca2+-sensitive dye. Cell Chr240. B, Plot of changes in fluorescence evoked by 40 msec duration pulse train versus changes in fluorescence during a single 320 msec duration pulse. The change is expressed as the ratio of maximum signal during stimulation (Rp) to the signal before stimulation (R0). Theline is a best fit with slope = 0.84 (r = 0.9; n = 7). The average total Ca2+ entry during a single 320 msec duration pulse was 95 pC, whereas during 40 msec pulse trains, a plateau signal was achieved on average in 3.4 pulses at a cumulative Ca2+ current integral of 77 pC (n = 11). C, Plot of changes in fluorescence ratio evoked by a 5 msec duration pulse train versus a 40 msec duration pulse train in the same cell. The line is a best fit with slope = 0.57 (r = 0.9;n = 11). During 5 msec duration pulse trains, a plateau signal was achieved on average in 16 pulses at a cumulative Ca2+ entry of 36.8 pC (n = 11). The fluorescence changes shown in Figure 12 are representative for chromaffin cells recorded in perforated-patch mode. The plateau level reached during a 40 msec duration, 200 msec interval train was linearly related to the peak change induced by a single 320 msec duration pulse (Fig. 12B). In contrast, the plateau levels reached during 5 msec duration pulse trains were consistently lower than those of 40 msec duration pulse trains (Fig. 12C). Peak changes and plateau values probably represent physiological processes rather than dye saturation. The plateau values of 40 msec duration trains were considerably lower than the maximal ratio after ionomycin application (Rmax/Rp = 1.77 ± 0.16; n = 6). The fluorescence responses described here are representative of most recordings (14/18 cells). There were two exceptions to these patterns (data not shown). In two cells, the fluorescence response to the first 40 msec duration pulse train was approximately two times as large as that to all subsequent trains, although it also settled at a plateau by the third or fourth pulse. In two other cells, the plateau value was unusually small during various train protocols. Several seconds after each train, the fluorescence signal rose abruptly to a much higher level and then fell, resembling an active “[Ca2+] spike.” This was never accompanied by a Cm increase. In summary, bovine chromaffin cells recorded in perforated patch mode appear to be much more effective at clamping [Ca2+]i during stimulus trains than cells recorded in whole-cell mode (Augustine and Neher, 1992; Seward and Nowycky, 1996). There is no obvious correlation between [Ca2+]i changes and the exocytotic Ca2+ efficacy evoked by particular stimulus protocols. Unexpectedly, loading cells with Fura Red and performing Ca2+ measurements caused several disturbances in theCm responsiveness (data not shown). These include (1) poor reproducibility for two identical protocols in individual cells; (2) disruption of the systematic relationship of Ca2+ efficacies between pairs of different stimuli within cells (e.g., 5 msec duration pulse trains occasionally evoked responses with lower efficacy than 40 msec pulse trains); (3) unusual patterns that were not observed in control conditions (e.g., 5 msec duration pulse trains that had enhanced efficacy during the early pulses and complete depression during later pulses); and (4) occasional unusually large Cm jumps in response to the first pulse of 40 msec trains (84 ± 20 fF evoked by 7.5 ± 0.3 pC; n = 54 responses in 18 cells) (compare with Fig. 7B,ii). Both the intracellular Ca2+handling properties and exocytotic responses in the presence of Ca2+ chelators require further investigation for chromaffin cells recorded in perforated-patch mode. The key observation in this paper is that bovine chromaffin cells recorded in perforated-patch mode have a repertoire of Ca2+-exocytosis relationships that are preferentially evoked by repetitive stimulus protocols. A simple standard transfer function adequately predicts the relationship between Ca2+ entry and amount of exocytosis when cells are stimulated with single depolarizing pulses (Engisch and Nowycky, 1996). Remarkably, the same transfer function applies to a subset of responses evoked by trains of depolarizing stimuli (Fig. 1). However, trains also evoke exocytosis with enhanced or diminished Ca2+efficacy relative to this function. Exocytotic responses with enhanced Ca2+ efficacy are evoked preferentially by protocols associated with small amounts of Ca2+ entry per pulse, whereas diminished or “depressed” responses are induced by protocols that evoke larger amounts of Ca2+ entry per pulse. Changes in Ca2+ efficacy during repetitive stimulation are not determined solely by the amount of Ca2+ entry per pulse, but by the balance between Ca2+ entry and the interpulse interval. Prolonging the interval of 40 msec duration pulse trains shifts the response pattern from depression to following the standard curve or enhanced efficacy, whereas shortening the interval of 5 msec duration pulse trains can prevent the development of an enhanced response. Our working hypothesis is that the single pulse relationship represents the “basal” Ca2+-exocytosis relationship, in the absence of Ca2+- and time-dependent modulatory processes. Both enhancement and depression develop during trains lasting several seconds and fade during the 2–5 min between stimulus trains, qualifying them as “short-term changes” in Ca2+ efficacy. The observation that pulse trains can evokeCm responses with the same Ca2+-exocytosis relationship as single pulses is unexpected. Pulsatile Ca2+ entry during a train will create very different submembrane [Ca2+] profiles than will a continuous long depolarization (Sala and Hernandez-Cruz, 1990; Nowycky and Pinter, 1993; Klingauf and Neher, 1997). As was emphasized in Engisch and Nowycky (1996), the standard transfer function does not relate exocytosis to submembrane [Ca2+], but simply serves as a predictor for the total exocytosis expected for a given amount of Ca2+entry. If intermittent Ca2+ entry during the many short pulses of a train can evoke a Ca2+-exocytosis relationship with the same upward curvature as a single long pulse, some components of the secretory machinery must be able to “remember” or “sum” Ca2+ entry across interpulse intervals. Another surprising feature is the fidelity with which the Cm responses to trains often adhered to a curve generated by averaging functions from 27 cells, which had a range of individual g and n values (Engisch and Nowycky, 1996, their Table 1). In effect, the many pulses in a train appear to average out the variability of single-pulse responses both within and between cells. Various forms of facilitation during trains of action potentials or depolarizing pulses have been described at both fast synapses and in whole-cell recordings of neuronal terminals, neuroendocrine, and endocrine cells (see introductory remarks). Commonly, most forms of facilitation are postulated to result from (1) an accumulation of intracellular or submembrane Ca2+ [variants of the “residual Ca2+” or “residual Ca2+-bound receptor” hypothesis (Katz and Miledi, 1968; Yamada and Zucker, 1992; Zucker, 1996)], (2) the existence of additional vesicular pools that are recruited during a train (Horrigan and Bookman, 1994; Gillis et al., 1996), or (3) requirements for an initial Ca2+-dependent priming step (Seward and Nowycky, 1996). Here, explanations (2) and (3) can be considered as specialized versions of the residual Ca2+hypothesis, in that experimentally increasing the amount of Ca2+ entry will more quickly achieve the condition in which there is additional exocytosis. An alternative form of facilitation is produced by the recruitment of Ca2+channels that are preferentially coupled to exocytosis (Artalejo et al., 1994). Enhanced Ca2+ efficacy as described here differs qualitatively from all forms of the residual Ca2+hypothesis because it is evoked under conditions of minimal Ca2+ entry. In most cells, shortening the interpulse intervals, a condition that should accentuate Ca2+accumulation, actually abolished enhanced responses. This is predicted by our working hypothesis that enhanced efficacy is a Ca2+- and activity-dependent shift from the basal responsiveness of a cell. 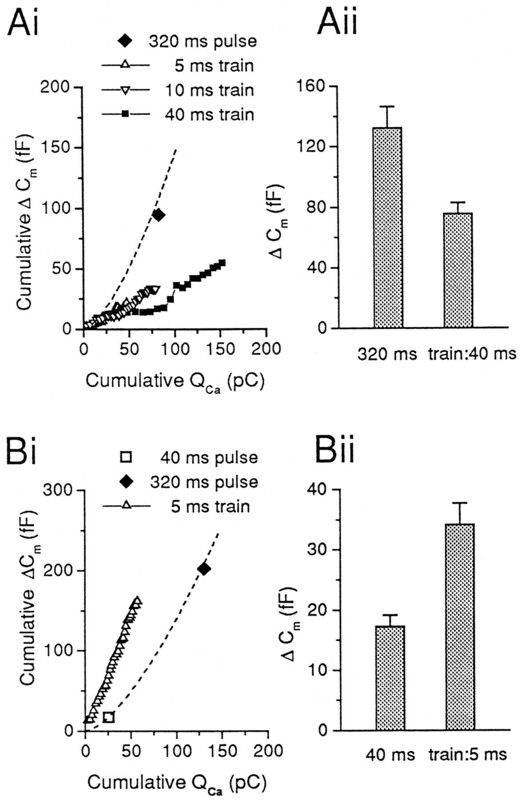 Enhanced efficacy is not caused by recruitment of “facilitation” channels, because Ca2+ currents exhibited typical inactivation during a train (Fig. 2). Finally, simultaneous capacitance and amperometric recording provide evidence that enhanced efficacy, defined by changes in the Cm trace, accurately reflects changes in the secretion of catecholamine-containing vesicles. Most models of secretory depression invoke the rapid depletion of release-ready vesicles (see introductory remarks). In our recordings, depression was associated with protocols that caused more Ca2+ entry, and depletion might be expected because of increased exocytosis. However, the total amount of exocytosis during a depressed response was much less than could be evoked in the same cell with a single long pulse, although the train spanned a time period that might be used for increasing the readily releasable pool. Depressed Cm responses are not the result of endocytotic processes masking exocytotic events, because simultaneous amperometric recordings verify that spike frequency declined concurrently (Fig. 10). Because capacitance recordings of isolated cells do not have the complications of postsynaptic changes, we can conclude that in chromaffin cells depression is a modulation of excitation–secretion coupling mechanisms that is actively induced by repetitive stimulation, independently of the vesicles available for release by a single pulse. A limitation of the present study is that enhanced and depressed Ca2+ efficacies are not defined by unique quantitative criteria, but only relative to the standard transfer function. Pulse trains of 40 msec were usually easily classified, as were 5 msec pulse trains with enhanced efficacy. The only problematic groups were responses evoked by 5 msec pulse trains that were either depressed or followed the standard curve, because of the small absoluteCm changes (usually a few tens of femtofarads, or several large dense-cored vesicles, assuming 2.0–2.5 fF/vesicle). Nevertheless, the distribution of response patterns is highly reproducible between cells and is a useful starting point for further study. as the amount of Ca2+ entry per pulse is increased at fixed interpulse intervals or as the interpulse interval is decreased for a given pulse duration. In summary, activity-dependent changes in the exocytotic responsiveness of bovine chromaffin cells appear to be determined by both the balance of Ca2+entry per pulse and the interpulse interval. In whole-cell recordings of many cell types and nerve terminals, fluorescence measures of average intracellular Ca2+are usually proportional to the amount of Ca2+ entry until they reach dye saturation, although the relationship is not necessarily linear (Thomas et al., 1990; Augustine and Neher, 1992;Ämmälä et al., 1993; Mollard et al., 1995; Seward and Nowycky, 1996). Exceptions do occur: neurohypophysial nerve terminals successfully clamp average [Ca2+]i at ∼500 nm regardless of Ca2+ load, unless the mitochondria are poisoned (Stuenkel, 1994). Bovine chromaffin cells in perforated-patch mode appear to regulate [Ca2+]i much more strictly than cells recorded in whole-cell mode. During repetitive pulse trains, a plateau in fluorescence is achieved that appears to represent a set-point to which [Ca2+]i is clamped. The similarity between the average [Ca2+]ievoked by the various stimulus protocols rules out the possibility that shifts between the various Ca2+-exocytosis relationships result from global elevation of [Ca2+]i and instead suggests that they are caused by intermittent Ca2+ elevations near the plasma membrane that are dissipated before they can be detected with our techniques. Many second messenger systems, cytoskeletal elements, and other agents can modify stimulus-secretion coupling of large dense-cored vesicles (for review, see Burgoyne, 1991). Capacitance techniques have sufficient temporal resolution and sensitivity to detect modulation at a single cell level. Activation of protein kinase C enhances the amount of exocytosis in chromaffin cells (Vitale et al., 1995; Gillis et al., 1996) and lactotrophs (Fomina and Levitan, 1995), whereas cyclosporin A, an inhibitor of calcineurin, a Ca2+-calmodulin-dependent type 2B phosphatase, depresses exocytosis in bovine chromaffin cells (Engisch and Nowycky, 1997). In pancreatic β-cells, exocytosis is potentiated by activation of protein kinase C and protein kinase A, or by inhibition of Ca2+-calmodulin kinase II and type I and 2A phosphatase (A̋mma̋la̋ et al., 1993, 1994). The repetitive stimulus protocols used here span several seconds, which provides sufficient time for Ca2+-dependent activation of several second messenger systems. The results indicate that excitation–secretion coupling in chromaffin cells, as in fast synapses, is dynamic, with distinct responses to patterned activity that cannot be extrapolated from responses to single stimuli well separated in time. This work was supported by National Institutes of Health Grant NS27781 (M.C.N. ), a grant from the Muscular Dystrophy Association (M.C.N. ), and National Institutes of Health Training Grant 5T32HD07467 (N.I.C.). K.L.E. is an Edward Jekkal Muscular Dystrophy Fellow. We thank Dr. Alla Fomina for helpful discussions, Drs. Stanley Misler (Washington University) and Kirk Kawagoe (Axon Instruments) for advice on amperometry measurements, and Axon Instruments for the loan of a Digidata 2000 Image Lightning board and Axon Imaging Workbench software. K.L.E. and N.I.C. contributed equally to this work. Correspondence should be addressed to Martha C. Nowycky, Department of Neurobiology and Anatomy, Medical College of Pennsylvania–Hahnemann University, Allegheny University of the Health Sciences, 3200 Henry Avenue, Philadelphia, PA 19129. (1993) Exocytosis elicited by action potentials and voltage-clamp calcium currents in individual mouse pancreatic B-cells. J Physiol (Lond) 472:665–688. (1994) Activation of protein kinases and inhibition of protein phosphatases play a central role in the regulation of exocytosis in mouse pancreatic β cells. Proc Natl Acad Sci USA 91:4343–4347. (1991) Three types of bovine chromaffin cell Ca2+ channels: facilitation increases the opening probability of a 27 pS channel. J Physiol (Lond) 444:213–240. (1994) Three types of Ca2+ channel trigger secretion with different efficacies in chromaffin cells. Nature 367:72–76. (1992) Calcium requirements for secretion in bovine chromaffin cells. J Physiol (Lond) 450:247–271. (1991) Control of exocytosis in adrenal chromaffin cells. Biochem Biophys Acta 1071:174–202. (1995) Fast exocytosis and endocytosis triggered by depolarisation in single adrenal chromaffin cells before rapid Ca2+ current run-down. Pflügers Arch 430:213–219. Engisch KL, Nowycky MC (1997) Compensatory and excess retrieval: two types of endocytosis following single step depolarizations in bovine chromaffin cells. J Physiol, in press. (1989) Phase tracking: an improved phase detection technique for cell membrane capacitance measurements. Biophys J 56:1153–1162. (1995) Three phases of TRH-induced facilitation of exocytosis by single lactotrophs. J Neurosci 15:4982–4991. (1997) Regulation of secretory granule recruitment and exocytosis at rat neurohypophysial nerve endings. J Physiol (Lond) 498:735–751. (1996) Involvement of mitochondria in intracellular calcium sequestration by rat gonadotropes. Cell Calcium 20:515–524. (1994) Calcium dependence of rate of exocytosis in a synaptic terminal. Nature 371:513–515. (1993) A two-step model of secretion control in neuroendocrine cells. Pflügers Arch 424:105–112. (1994) Kinetics of the secretory response in bovine chromaffin cells following flash photolysis of caged Ca2+. Biophys J 67:2456–2557. (1996) Rapid exocytosis and endocytosis in nerve terminals of the rat posterior pituitary. J Physiol (Lond) 494:539–553. (1988) Capacitance measurements. An analysis of the phase detector technique used to study exocytosis and endocytosis. Biophys J 53:885–892. (1968) The role of calcium in neuromuscular facilitation. J Physiol (Lond) 195:481–493. (1990) Direct measurement of exocytosis and calcium currents in single vertebrate nerve terminals. Nature 344:449–451. (1987) Short-term changes in synaptic efficacy. in Synaptic function, eds Edelman GM, Gall WE, Cowan WM (Wiley, New York), pp 21–56. (1995) Activation of nicotinic receptors triggers exocytosis from bovine chromaffin cells in the absence of membrane depolarization. Proc Natl Acad Sci USA 92:3065–3069. (1982) Discrete changes of cell membrane capacitance observed under conditions of enhanced secretion in bovine adrenal chromaffin cells. Proc Natl Acad Sci USA 79:6712–6716. 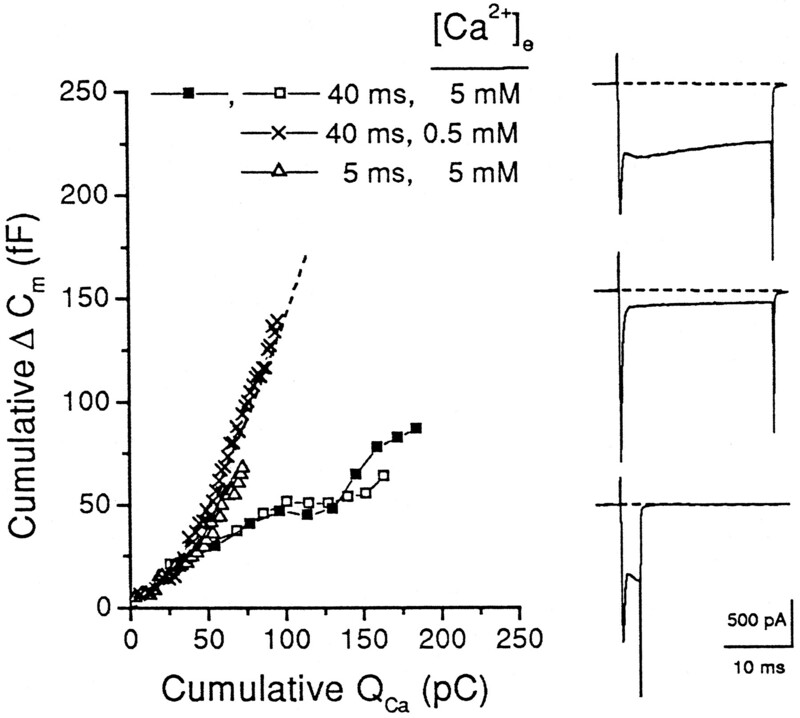 (1993) Time course of calcium and calcium-bound buffer transients in a model cell. Biophys J 64:77–91. (1993) Release of LHRH is linearly related to the time integral of presynaptic Ca2+ elevation above a threshold level in bullfrog sympathetic ganglia. Neuron 10:465–473. (1992) Cytoplasmic calcium transients due to single action potentials and voltage-clamp depolarizations in mouse pancreatic B-cells. EMBO J 11:2877–2884. (1990) Calcium diffusion modeling in a spherical neuron. Relevance of buffering properties. Biophys J 57:313–324. (1996) Synapses get smarter. Nature 382:759–760. (1995) Exocytosis in peptidergic nerve terminals exhibits two calcium sensitive phases during pulsatile calcium entry. J Neurosci 15:3390–3399. (1994) Regulation of intracellular calcium and calcium buffering properties of rat isolated neurohypophysial nerve endings. J Physiol (Lond) 481:251–271. (1990) Cytosolic Ca2+, exocytosis, and endocytosis in single melanotrophs of the rat pituitary. Neuron 5:723–733. (1991) Differential release of amino acids, neuropeptides, and catecholamines from isolated nerve terminals. Neuron 6:517–524. (1991) Cortical filamentous actin disassembly and scinderin redistribution during chromaffin cell stimulation precede exocytosis, a phenomenon not exhibited by gelsolin. J Cell Biol 113:1057–1067. (1992) Time course of transmitter release calculated from simulations of a calcium diffusion model. Biophys J 61:671–682.